President Moon Jae-in's fan — the so-called "Moonppa," a portmanteau of "Moon" and "ppa," slang for "diehard fan" — have made headlines daily for their aggressive activities to support the liberal head of state. Their most controversial action so far is the use of "text bombs," in which they deluge a Moon opponent with abusive or threatening text messages. The attack targeted the opposition bloc during the National Assembly confirmation hearing for Prime Minister Lee Nak-yon. After receiving a flood of abusive text messages, the conservative Liberty Korea Party decided to take legal action against these Moon supporters, and the People's Party eventually organized a task force to solve the issue. "The damage caused by text bombs is beyond the boundaries of freedom of expression, thus requiring the reaction of the party," spokeswoman Kim Yoo-jung said Wednesday. Rep. Lee Un-ju, who defected from the ruling Democratic Party of Korea (DPK) to the People's Party, was the main target of the attacks for her "betrayal." After receiving countless assault threats and sexual insults via text messages, Lee eventually changed her phone number. But this is not the only group actions. It has also criticized the nation's liberal and progressive newspapers — Hankyoreh, Kyunghyang Shinmun and OhmyNews — for what they perceive as unfavorable coverage of Moon, and many supporters have unsubscribed from such media outlets. And even though media critics say the outlets are not so hostile to Moon, his supporters nevertheless cherry-pick stories that appear unfavorable and distribute them via online communities. Some pro-Moon citizens' deep mistrust of progressive media outlets originates from their own experience. 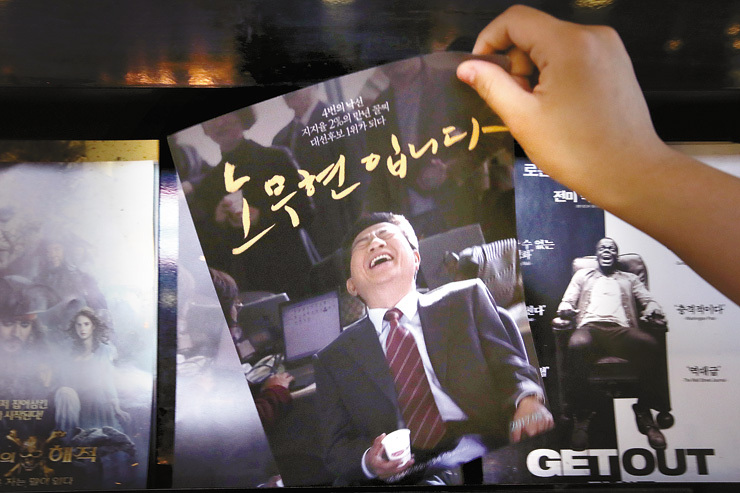 In 2009, when the prosecution was investigating former President Roh Moo-hyun for bribery allegations allegedly raised by then conservative President Lee Myung-bak, Moon served as Roh's lawyer. On May 23 that year, Roh jumped to his death. Roh's supporters believed that liberal and progressive newspapers were collaborators in the circumstances that led to Roh's suicide, one of the most tragic moments in the nation's history. Though criticism of Roh by the conservative media was harsher, allegedly in connection with the politically biased prosecution and intelligence agency, criticism from the liberal media was more damaging and is considered by Roh's supporters as a betrayal. However, it is still difficult to understand Roh supporters' strong antipathy toward liberal outlets considering journalism's role of ensuring checks and balances. To understand the unique sentiment of Roh's supporters, it is essential to look at his bumpy political path from the son of a poor farmer to president. Roh, who did not have a college diploma, had always been marginalized in the world of politics. However, with great speaking skills and strong Busan dialect, the former human rights lawyer was always confident, in fact bold enough to throw his nameplate in a protest against military dictator Chun Doo-hwan in 1989. The politician was nicknamed "fool" and called a "roly poly" who never gave up his long-cherished dream: break the rigid wall of regionalism between the nation's eastern Gyeongsang Provinces and the western Jeolla Provinces. His spectacular life is well documented in the movie "Our President" that premiered May 25. His fan club, "Rohsamo" — which literally means "people who love Roh" — was always behind him. Amid a lack of funds, they continued to campaign for Roh's presidential bid, subsisting on instant noodles and lunchboxes. In 2002, nobody expected Roh, who had no political faction, would be nominated by the Millennium Democratic Party, the predecessor of the DPK. "It was the most glorious moment as a Rohsamo member," a campaigner says in the movie. Ruminating over their intense memories of their "idol," everyone in the movie — from a former spy in charge of monitoring his movements, to a driver and a staffer at his law firm — ends up crying. 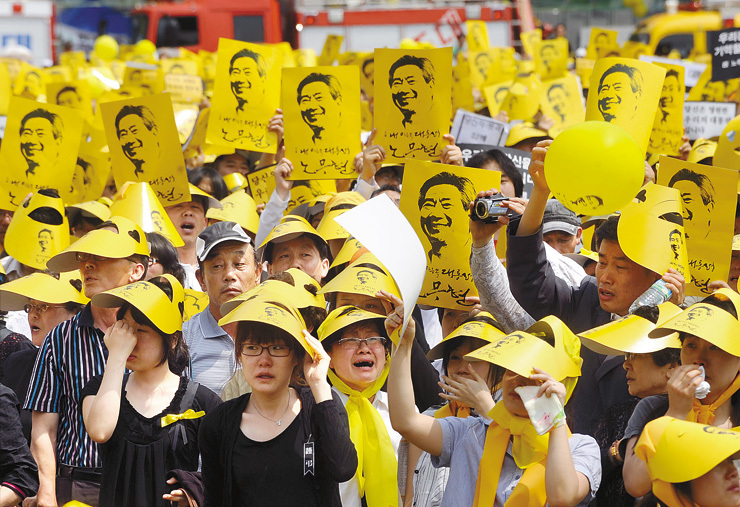 While Roh's fandom lost momentum following his political missteps, more than a million people flocked to his hometown of Bongha Village from May 23 to 29 in 2009 to pay their respects, and people with yellow ribbons took to the streets May 29 to bid him farewell. For them, Roh's death was more than that of a politician but a failure to achieve his goals for the country. "He was an adorable person, highly talented in attracting people," said author Rhyu Si-min, health minister during the Roh administration. In addition to pity, a sense of guilt haunts his supporters that they failed to "protect" him. Given that Moon was Roh's longtime friend and political heir, many Roh supporters did not hesitate to commit their absolute unconditional support to Moon. In Bongha Village, after Moon's landslide victory, some supporters vowed to protect him to avert another tragic end. They fear the media and political opponents may harm him, as they did Roh. For some, Moon is an "avatar" of Roh. "Moon is the one who stands in line with the spirit of Roh," a woman surnamed Jung, 54, told The Korea Times. "He truly knows what's right and what's wrong. I trust him unconditionally." Jung flew from Washington, D.C., to the village to take part in the latest commemorative event for Roh. This level of support is in line with Rhyu's remark May 5, just before Moon was elected: "I will be a government-patronized scholar." On May 9, after Moon's victory was palpable, An Hee-jung, a former presidential hopeful of the DPK and Roh's associate, passed on a request to a joyful group of Moon's supporters: "Please be behind Moon for five years, even if he seems to take the wrong road." Harmful effect of social media? Interestingly, a core Rohsamo member in 2002, Yoon Seok-gyu, pointed out the difference between Rohsamo and loyal Moon supporters. "The composition of Moonppa is different from that of Rohsamo," Yoon told The Korea Times. Some Moon loyalists are in their 20s and 30s, which means they do not have clear memories of the "Roh frenzy" in 2002 and suggests that some became favorable to Moon after Roh's death or later by watching past video clips. The largest difference between Rohsamo and Moonppa is "blind loyalty," Yoon said. "When Roh made mistakes, we, in the initial stage, used to keep our distance from him or leave him. However, I can't find reflective thinking among those who are loyal to Moon. Celebrities like Rhyu are serving as ideologues for them." The core reason for the differences between the two groups of supporters originates from the emergence of social media, Yoon said. "Rohsamo was based on a sole website, since we didn't have smartphones or social networking sites. Now, Moon fans are scattered over many channels, making it difficult to control their passion." The new online trend among Moon supporters is facilitating such deviations. As shown in the movie, Rohsamo's No. 1 slogan was "destruction of regionalism." The members' shared ambition was reaffirmed on their official website. However, it's hard to find a common ideology in pro-Moon online communities. Some even resemble far-right groups when they insulted homosexual activists and defined "labor unions" as an "old evil to be removed." As the conservative Chosun Ilbo newspaper pointed out in an editorial: "Anybody who criticizes Moon is categorized as an old evil." Fortunately, Moon seems aware that these supporters' fervor based on Roh's legacy is not so helpful. In a determined speech at the eighth commemorative event last month to mark Roh's death, Moon said he will "keep his longing for Roh in his heart," and not visit Bongha Village again as President. Not all of Moon's supporters are members or approve of his aggressive fan club. "I think the text messages have some positive influence as a direct expression of democracy," Han Jang-heon, 45, a backer of both Roh and Moon, told The Korea Times. "However, I hope and believe that such controversial actions will calm down in the end, as citizens themselves controlled violent behavior during the anti-president street rallies last year," said Han, who also visited Bongha Village this year to attend the commemorative event. Now, it is time for the fans to determine how to back Moon's reformative initiatives and achieve Roh's unfinished dream.